Rose About Town: FLOWERING ARBOVITAE? 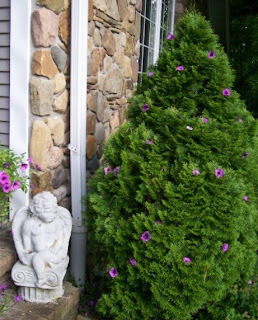 Do YOU have a flowering arborvitae? Call this a flowering arborvitae, very rare. Or call it a mischief tree, not so rare when you have a husband with a sense of humor. Just before dark yesterday, I had brutally trimmed back a pot full of overly-leggy petunias to shock them into filling in more fully. This morning, I sat down with my morning coffee and glanced out the window at this amazing sight. I glanced over at my husband, and his eyes were twinkling; I suddenly knew he had picked up the fallen petunias and set them in the arborvitae for my morning surprise. It might have been his revenge on behalf of my now-grown boys. Years ago, they had babied a cactus along as a house plant, and one day I carefully attached a very-real-looking faux flower to the plant for them to find when they arrived home from school. They had proudly showed off their flowering cactus at least once before someone spotted the "faux" factor.